For a long time the only tool available to support the breech during the barrel pin removal or installation is made from aluminium and this tool was designed to work only on the AKM type of rifle. The GS-0007 pictured above is for use with all stamped slabside (AKM, AK-74) and stamped bulged (M70, M72, RPK) receivers. In addition; it works for the milled receiver rifle. It is the first “hands free” tool of its type that can hold all types of Kalashnikova receivers. The tool comes as the primary base with a trough milled to receive the bulged part; plus a support spacer of two (02) heights, a securing screw, a 0.040″ shim, a 0.060″ shim, and a simple clamp meant to hold everything in place. The use of the tool is quite simple. 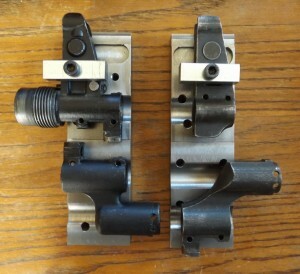 The tool is ambidextrous so the right side (facing up for press-in) or left side (facing up for press-out) of the receiver can be placed correctly. Merely align the hole used with the pin hole and clamp everything in place. The receiver will stay steady throughput the pressing process allowing freedom to use both hands. It works whether the stamped receiver is present or completely removed. If the breech block is stripped of the receiver a shim of appropriate thickness is used to keep all things level. One (01) caveat! This tool uses a lightweight clamp to hold things in place. 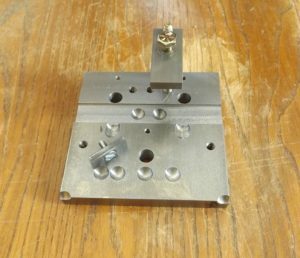 This clamp is not designed to hold the assembly for drilling or milling a barrel pin hole! 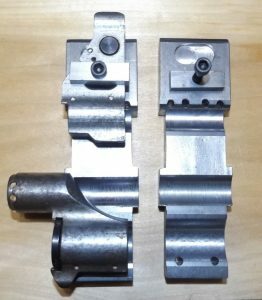 The base plate can be used to hold a finished firearm but a much stronger clamp (such as a milling machine clamp) must be used. For a long time there was no tool available to support the front sight or gas block when pins are driven or pressed out or in. This is the first “hands free” tool of its type that can hold these parts. 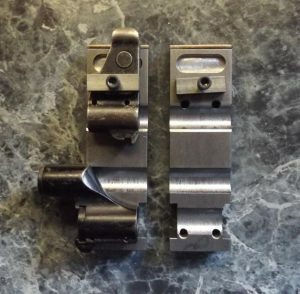 The tool comes as the primary base with troughs milled to receive the contoured parts and a short clamp and screw to secure the front sight block. The use of the tool is quite simple. The tool is ambidextrous so the right side (facing up for press-in) or left side (facing up for press-out) of the blocks can be placed correctly. Merely align the hole used with the pin hole and clamp the front sight in place. The gas block stays fairly steady without a clamp. This allows the user to have both hands available. Designed along the same idea as the GS-0021-A, the GS-0021-B is used for the removal and installation of the dowel pins of the Type III Soviet-era rifle as well as Type III clones produced by other Warsaw Pact Countries. Designed along the same idea as the GS-0021-A, the GS-0021-C is used for the removal and installation of the dowel pins of the Zastava M72 RPK. The tool comes as the primary base with troughs milled to receive the contoured parts and a short clamp and screw to secure the front sight block. The gas block may need a clamp depending on the arrangement, and for this I suggest placing the plate near the edge of the workbench so the bipod legs can be in mid-air. The use of the tool is quite simple. The tool is ambidextrous so the right side (facing up for press-in) or left side (facing up for press-out) of the blocks can be placed correctly. Merely align the hole used with the pin hole and clamp the front sight in place. Clearance is provided for the sling loop and the bipod pivot.